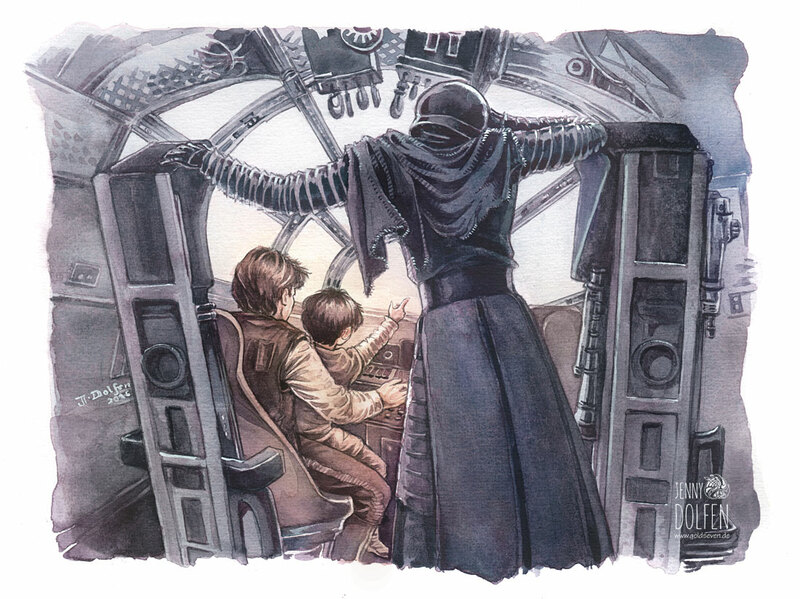 … in which I refuse to feel ashamed for loving Kylo Ren. This piece was a commission for Deanna, one of my fantastic supporters over at Patreon. She threw a few ideas my way and we ran with Ben Solo as a young Jedi in training, corrupted to the Dark Side by Snoke, torn between the light and the dark but having his path laid out for him through his fear and aggression. I can’t believe how much fun it is to figure out this character, and seriously, the only thing that’s keeping me from taking the path to the Dark Side of Fan-fiction is a deeply ingrained aversion against being rendered AU in two years’ time. Art will have to suffice. I put enough story in that to satisfy my needs for explaining the character, but try to leave it symbolic enough so it’ll still work when Episode VIII is out! The reactions to Kylo Ren are really interesting. Most critics agree that he’s one of the most interesting characters this franchise has had, and certainly the most compelling bad guy. When you’re a teacher in Germany, that picture is slightly different. Quite a few of my students tell me they hated Kylo Ren. The expectations for the character were certainly high. In the lead-up to Episode VII, he was everywhere, even on mineral water. You expected him to be the next big bad, and were prepared to embrace your inner badass when you saw him on screen. I think the marketing really has a lot to do with the bad press Kylo Ren gets among younger fans of Star Wars. And then, of course, he’s got it especially hard in Germany, as the guy who lent him his voice also voices JD from Scrubs. (Funnily, he also voices Dean Winchester, but I never would have known. For Kylo Ren, he definitely gave it a lot more John Dorian and a lot less Dean Winchester.) I don’t know if teenagers in Germany know much Scrubs these days, but the rather whiny voice doesn’t really help. My ears did a couple of double-takes when I heard Adam Driver’s original voice. (His clipped “I’m being torn apart” becomes a melodramatic “Ich bin innerlich zerrissen” in German, which is best translated as “I’m rent on the inside”. Way to kill off that character for German audiences!) My kids will have to endure the movie in English as soon as it comes out on DVD, I can tell you! Here, kiddo, it’s English. It’s good for you. Your resident English teacher says so.